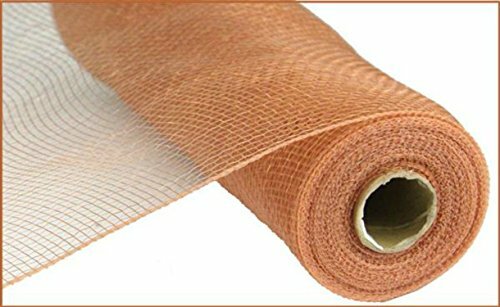 10-inch wide, 10 yard roll of Rose Gold deco poly mesh. Perfect for decorating, wrapping and crafts; this plastic mesh is waterproof, durable and reusable. A ten yard by 10" wide roll of woven poly mesh in a metallic rose gold color with metallic thin strips of rose gold woven down the mesh. This versatile mesh is perfect for decorating, wrapping and crafts. Plastic mesh is waterproof, durable and reusable. Color: Rose Gold, Foil Level: Standard , Roll Length: 10 Yards, Width: 10 inches, Design: Solid. A ten yard by 10" wide roll of woven poly mesh in a metallic rose gold color with metallic thin strips of rose gold woven down the mesh. This versatile mesh is perfect for decorating, wrapping and crafts. Plastic mesh is waterproof, durable and reusable. Deco Poly Mesh is an incredibly versatile material for decorating, wrapping and more. It's inexpensive, it's reusable, and it's weather resistant. It's perfect for decorating indoors or outdoors, although some fading may occur over long periods of direct sun exposure. Our deco mesh is of the highest quality, and holds its shape beautifully. Whether you're making a wreath, a garland, or a bow, the beautifully full ruffles, curls and poofs that you fix into your design will stay that way. These 10-inch wide rolls of Deco Poly Mesh are great for various decorating projects where you don't need the full width and body of the 21-inch version. This width is great for making bows, wreaths, garlands and more. One popular wreath-making technique using ten-inch mesh is the "Ruffle" method. The uses for Deco Mesh are really endless. If you have any questions about this product by Craig Bachman, contact us by completing and submitting the form below. If you are looking for a specif part number, please include it with your message.